Germany is renowned for its Spargel in spring. 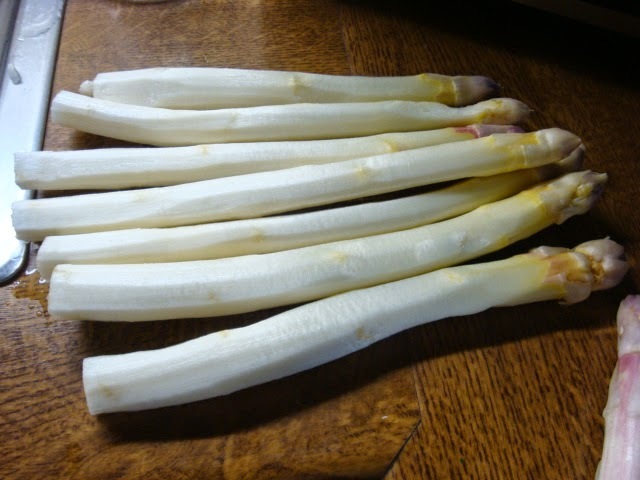 White asparagus grows in abundance throughout Baden-Württemberg and elsewhere throughout the country. You will find it on every fine restaurant menu from late April until late June, as well as on the menu of many Gasthäuser, small and large. This year, it was the earliest we have seen due to a very early and warm spring. Hans Partenheimer offered to organize a Spargel Essen for the third and last officially planned reunion event. 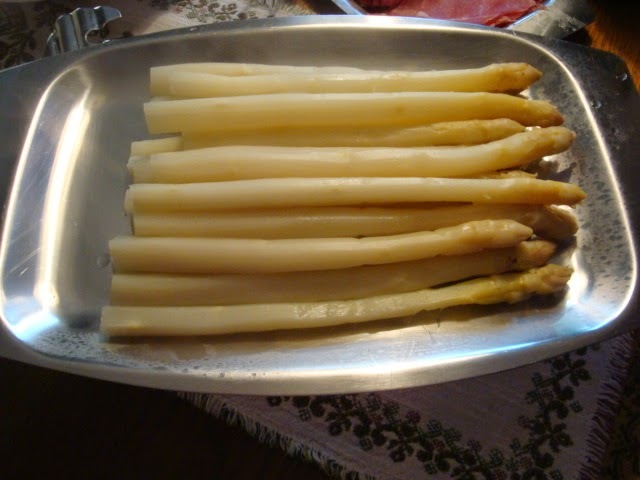 In other words, a white asparagus meal, something not common in Canada, especially as the star of a dinner. On Tuesday, 6 May, sixty-two of us gathered in Dörlinbach at the Gasthaus Engel, one we know well. This Gasthaus has been in the Grimm family for several generations, now owned and run by Martin Grimm, his wife Monika and his brother Ulrich. Martin is the cook and a very good one. Hans at left before the guests arrived. They had set up the room perfectly for us all, a large number of guests for an asparagus dinner when you consider that each stalk of asparagus has to be peeled before it is cooked. We knew that there would be plenty, as much as you wished to eat. They must have been peeling for hours! 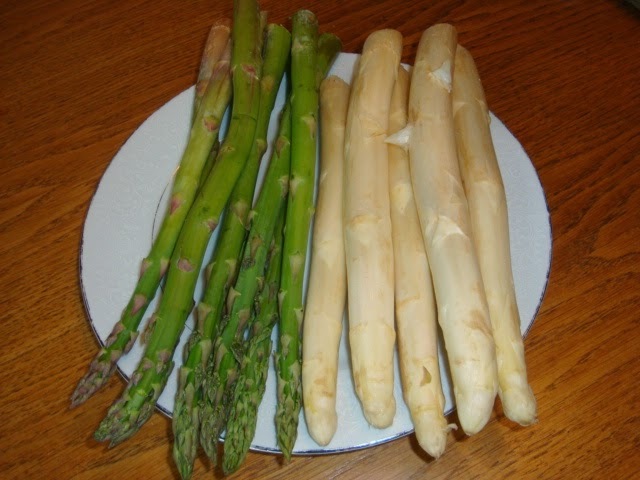 The white asparagus on the left has not yet been peeled; that on the right has been. We were all there for the white asparagus first and foremost, but what accompanies it is also important. Everyone who serves Spargel, whether at home or in a Gasthaus, serves the same accompaniments, although not necessarily every one we had that evening. 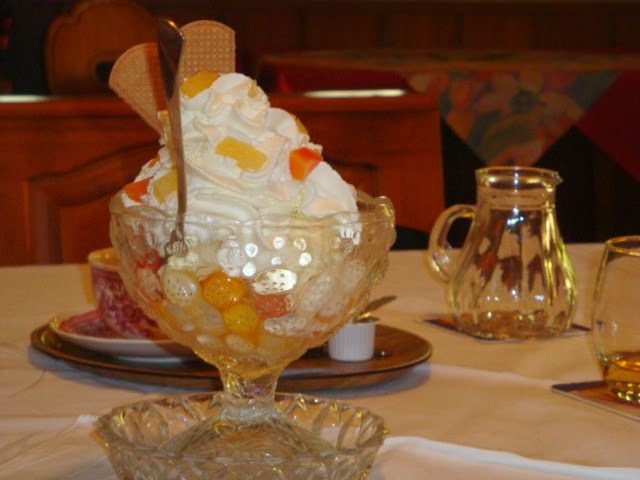 At a restaurant or Gasthaus you usually get a choice and the more you ask for, the more it will cost. Often, potatoes or Kratzete are offered, not both, and perhaps only one type of Schinken. If you wish to have two or three varieties of Schinken and both potatoes and Kratzete, you pay extra. On this occasion, Hans asked to have new boiled potatoes, Kratzete and three types of Schinken (Martin served four) as well as Sauce Hollandaise, which is standard usually. I, for example, love the Kratzete and it wouldn't be the same dinner without it for me. The Sauce Hollandaise that comes with the Spargel is also great on the potatoes and the Kratzete. Hans and I heard the name 'Dummis' for the first time recently. When telling some German friends who live in Hofstetten (across the mountain toward Triberg and into the hills) about our dinner, they told us that that is what they call the Kratzete. Kratzete and Dummis--crepes that are pulled apart into pieces--are one and the same. In this region they are well known by those names. We, however, had never seen the word Dummis on a menu or heard of it. No one had ever mentioned it to us. So we learned something new. 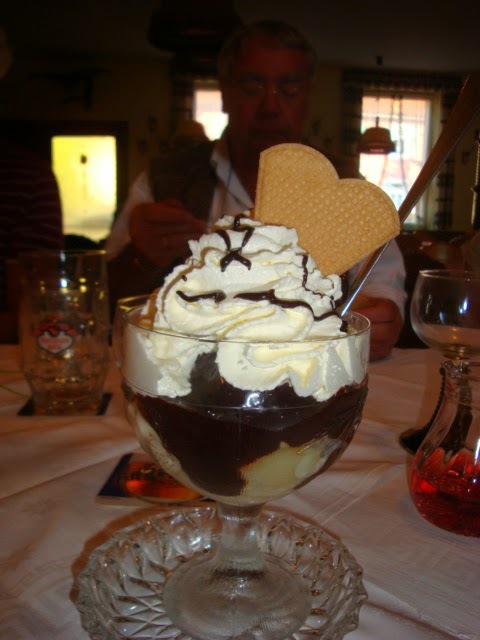 Here are a few pictures of the various dishes we were served at the Gasthaus Engel. To begin the meal, a flavourful watercress soup. The platters and bowls were placed on all the tables with the guests helping themselves. Soup began the dinner. Then, platters of the white asparagus and lots of it; sauce boats filled with hot Sauce Hollandaise; bowls of new boiled potatoes and Kratzete and platters of Schinken or ham: the renowned Schwarzwälder Schinken (Black Forest ham, smoked); slightly smoked Schinken; unsmoked Schinken or ham and Martin's wild boar Schinken. The room we were in epitomizes Martin's love of hunting. A full plate below! As I forgot the pitchers of Sauce Hollandaise, you can see it on the Spargel below. Some years ago we had a Spargel meal sitting beside a river in the former Eastern Germany (the DDR). It was noon hour and a beautiful day. We wondered what their Spargel would be like. Instead of Sauce Hollandaise, they served warm melted butter. We both enjoyed it very much, especially Hans who had grown up in the DDR and remembered that well. A good friend of ours here serves hers with a Krauter or herb sauce. However, Sauce Hollandaise is served most often in the Schwarzwald. A few people that evening may have had dessert. Here are two of the sundaes that might have been ordered. The one on the left is filled with fruit and whipped cream. The one on the right has a pear, hot chocolate sauce and whipped cream, one of my favourites. There could be a little Schnaps on the fruit. The pictures following were nearly all taken before dinner was served. I was busy eating later and forgot to get a shot of the table although I took several beforehand. The first picture is the same table as shown at the beginning, but from the opposite end. It was our table. A view of the room; I am in green below left. We were the last to leave at around 11 p.m. I took a picture of the bar, with the waitresses almost out of view and cleaning up for the evening. You can see a little of the waitress's German traditional dress. Behind the bar to the left is a small view of the kitchen. Martin is shy and rarely takes a bow. We said our goodbye and our thank you for the dinner and the service, both of which were excellent.